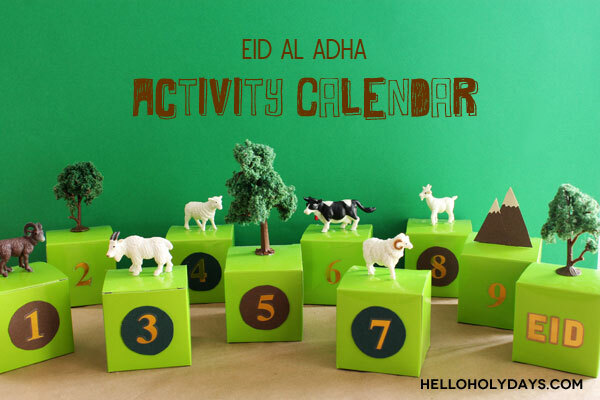 Eid Al Adha Activity Calendar – Hello Holy Days! *To help you find materials and suggested products for this project easily, this post contains affiliate links. Hot glue animals and trees to top of favour boxes. 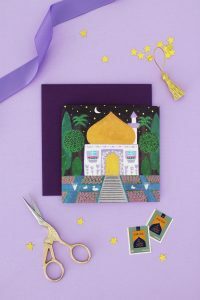 For the 9th day, which is known as the Day of Arafat, cut out a mountain shape from a piece of construction paper to symbolize Mount Arafat. 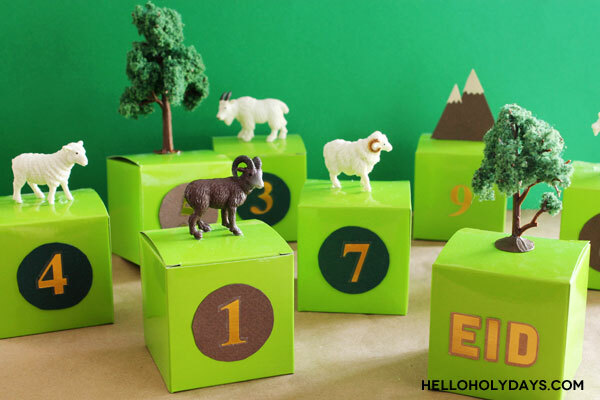 Cut out circles from green and brown construction paper, larger than the sticker numbers you plan to use. Glue paper circles to front of boxes; consider omitting the paper circle on some favour boxes for visual interest. Adhere sticker numbers to the front of 9 boxes. On the 10th box, spell out “Eid” with alphabet stickers. Fill each box with paper grass or a bit of green tissue paper. Write out activities on pieces of small pieces of paper and place inside favour box. On the 10th box, fill with candy, small trinkets/ toy or directions to where kids can find their Eid present. Play with plastic Eid animals (goat/ sheep/ camels/ cows) or head to a petting zoo! Let’s play dress up! Dress up like a pilgrim – use a white sheet and wrap it around like a toga. It’s the Day of Arafat! Try a short fast, as suitable for age. Eid Mubarak! Time for presents/ favours!